Abstract: Interaction-free measurement (IFM) has been proposed as a means of high-resolution, low-damage imaging of radiation-sensitive samples, such as proteins and biomolecules. The basic setup for IFM is a Mach-Zehnder interferometer (MZI). Recent progress in nanofabricated electron diffraction gratings has made it possible to incorporate an MZI in a transmission-electron microscope (TEM). In this talk, we will describe a modular, self-aligned, amplitude-division electron interferometer in a TEM. The interferometer consists of two 45-nm-thick silicon layers separated by 20 µm. Further, we will discuss our calculations comparing the error probability and number of scattered electrons for IFM and classical imaging schemes, with and without an additional detector for scattered electrons, for a black and white sample, with this interferometer. The additional detector reduced error for the same number of scattered electrons by an order of magnitude, for both IFM and classical schemes. We will also investigate a sample re-illumination scheme based on updating priors after each round of illumination until a stopping criterion is met. Implementation of these methods is likely achievable with existing instrumentation and would result in improved resolution in low-dose electron microscopy. 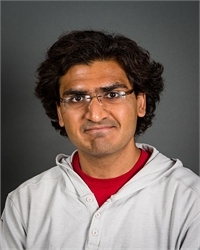 Biography: Akshay Agarwal is a graduate student in the Department of Electrical Engineering and Computer Science at MIT. He received his Bachelor's and Master's degrees in Electrical Engineering from the Indian Institute of Technology Bombay, India in 2014. His current research focuses on electron diffraction and interferometry as part of the free-space quantum electron microscope project.